In January 2008, the situation at Liverpool FC led to a series of events off the pitch that have forever altered the role of supporters in our football club. We had, for over one hundred years, offered unwavering support to the club and the team. We, the supporters and those within the club, were united in making LFC the most successful British club ever. The Sandon Public House, the birthplace of Liverpool FC, saw 350 supporters cram into the backroom on a wet evening on 31st January 2008. They weren’t there to talk football matches, or managerial appointments. Instead supporters found themselves entering a new area of discussion – the ownership of the club we all love. Tom Hicks and George Gillett were quickly becoming the owners we had been promised they wouldn’t. Their pledge to be custodians was sounding hollow, and their lies and broken promises were mounting. Angry at the situation, supporters listened and debated about what we should do to protect our club. The answer was clear – We had to act, we had to protest, we had to do something. Spirit Of Shankly was born. Those present discussed the issues we had faced as supporters. It was clear we wanted Tom Hicks and George Gillett out. Yet our issues didn’t end there. Supporters talked of how those at the club ignored our issues, our views, our problems. Spirit Of Shankly would not just be a protest movement. It would be a Union for all supporters to be a part of, to represent their best interests and to speak with one voice to ensure supporters were heard. 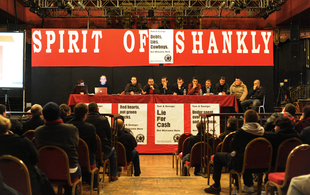 Much work has gone in to making Spirit Of Shankly the organisation it is today. We are a registered Industrial and Provident Society and we are registered with the Financial Services Authority. We have a legal constitution and a democratically elected management committee, elected by our members, working towards our aims. Most importantly, Spirit Of Shankly has strived to do its best for its members, and subsequently the wider supporter base. We were the catalyst for supporter campaigning against the ownership of Tom Hicks and George Gillett , leading dozens of successful protests and notable campaigns to ensure the owners sold the club. We worked closely with the family of Michael Shields to ensure he was freed from his wrongful incareceration. As a Union we have listened to members on the issues they face – Ticketing, Travel, Policing, Stewarding, Regeneration and much more. We have had successes, and we have ensured that Liverpool supporters have a voice that speaks up for them on the issues they face. The work of Spirit Of Shankly will continue. Tom Hicks and George Gillett have gone, but the loyal supporters remain. Whilst they do, they need a voice. We will continue to be that voice. 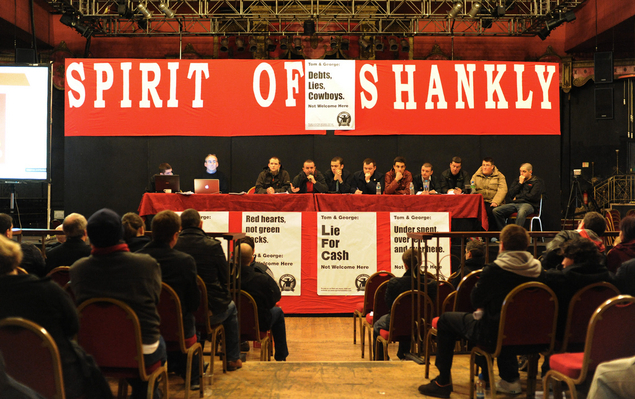 Spirit Of Shankly – Liverpool Supporters’ Union. Your Union.